rock debris, which can be easily crossed. The lower reaches of the creek draining the south side of Mt Split Open are steeply gorged and impassable. 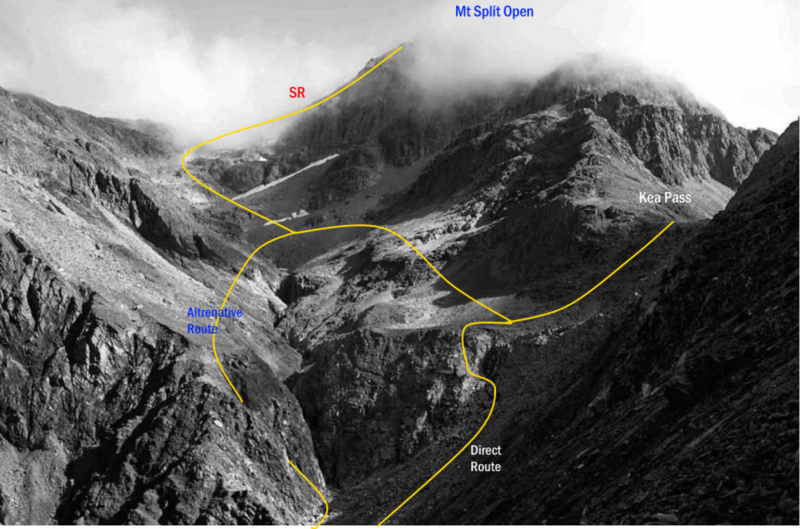 From Kea Pass, or the shelf below the pass, sidle across relatively flat ground above the gorge (true left) and below the bluffs of Mt Split Open to scree and rock slabs leading to the col at the foot of the South Ridge. Follow the ridge to the summit. From Kea Pass. No record. Climbers attempting to descend reported smooth rock faces.